Stop riding on static rollers or trainers, and experience the E-Motion magic. Not only are we the best roller you can buy, we're also the best trainer too. You get our famous motion-based roller experience, or with our optional "floating"
fork stand, transform the rollers into the best rocker-trainer available. No other bicycle trainer comes close. 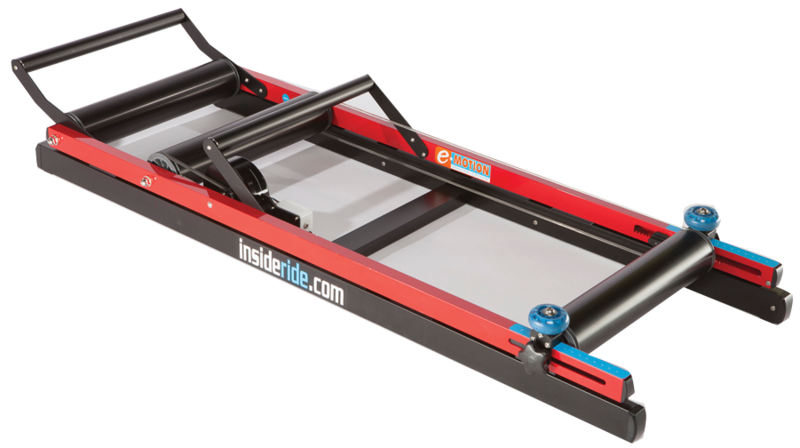 technology makes long indoor rides on the E-Motion rollers more comfortable, realistic and fun. reducing the risk of rolling off by gently nudging you back on track. with non-contact magnetic roller resistance. Multiple settings allow you to dial up your efforts. Check out our Zwift compatible Smart resistance control. create a quiet and smooth rolling surface that won't wear your tires down. allows for fast and precise accommodation of a wheelbase 36.5in (93cm) to 42.5in (108cm). with FREE SHIPPING within the continental United States.